Be sure not to waste time creating an ecourse that does not support your goal of getting leads and sales or attracts the wrong audience. Simply copy the proven method we use to create ecourses quickly and without expensive equipment. Doing this one thing can make the difference between an ecourse that helps you sell your products and services or one that is just gathering dust on your website. Your funnel is what turns visitors into subscribers and subscribers into customers. It's the most important (and often overlooked) piece of the puzzle to generate leads & make sales through a free ecourse. Creating an ecourse is not enough, you need students! With these 10 promotion strategies you're sure to get as many subscribers as possible. You'll get 4 short and actionable video lessons that you can watch at your own pace. With every lesson you'll get worksheets, checklists and more to help you build your ecourse faster. 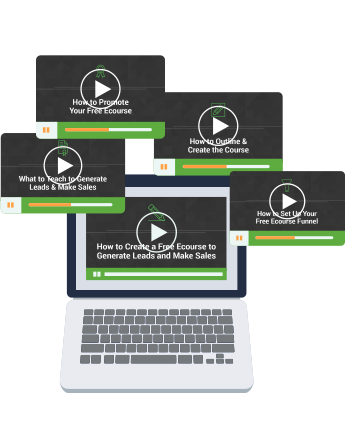 You'll get immediate access to the entire course so you can start building your free ecourse today! Start Building Your Ecourse Today!